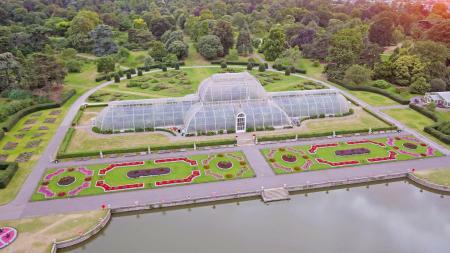 The largest UNESCO World Heritage Site in London, Kew Gardens is a park with a difference, home to 30,000 plant species (including the world’s oldest pot plant). 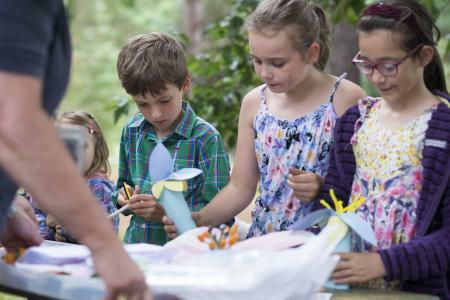 A natural paradise that offers the space and inspiration to play and appreciate the outdoors whatever the weather, we visited to find out what's on offer for children and families. 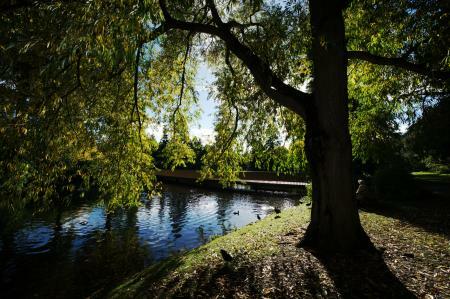 Kew is a national treasure that must be seen, and every visit will be different if you're lucky enough to come more than once, from the golden leaves of autumn and the mass bluebells of spring to the glorious cottage gardens of summer. Elisabeth and Brad Galvin visited with Mary, 5, and William, 3. With the largest and most diverse collection of living plants in the world, Kew Gardens is a vital centre for botanical research as well as a beautiful place to stretch legs little and long. There is a ‘tree library’ of more than 14,000 types and you can enjoy a whole gamut of gardens, from the Grass Garden to the Japanese Garden complete with pagoda. Even those with not a single green finger can’t fail to be impressed by the magnificent Great Broad Walk Borders – take a deep breath and get a lungful of all that healthy oxygen! You can even explore England’s smallest royal palace, Kew Palace. The giant badger sett is a wonderland for little imaginations. William absolutely loved tunneling through the underground maze and discovering the burrow that is (just) big enough for adults to crawl through. The Log Trail is great fun, and came about after so many trees fell down after the great storm of 1987. 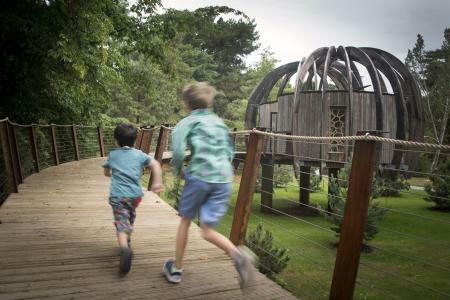 A series of logs have been placed next to each other to make a trail through the trees and it will test your hopping and balancing skills as well as the kids’! See if you can identify the trunks, including ash, beech and eucalyptus. The 200m-long Treetop Walkway is a sight for urban eyes. Walking 18m above the ground gives a completely different perspective on the Gardens (and London itself – you can see across the west on a clear day). We saw and heard green parakeets flying through the trees – noisy! The Palm House is surely the warmest place in London, and is an enormous hothouse that was the largest of its kind when it was built in 1844. It remains the most important surviving Victorian glass and iron sculpture in the world. It is bursting with tropical plants such as the cocoa tree from Central America that was discovered 2,000 years ago and a banana tree from Australia. Some species here are endangered and even extinct. The best bit is climbing the white wrought iron staircase to the viewing walk from the roof. There is always something on for the kids at Kew – from nature trails, crafts, storytelling and Easter egg hunts to appearances by special visitors (the Moomins have been spotted!). The Gardens are extremely family-focused with baby-changing facilities near all main areas, cafes and the gates. There’s a buggy-friendly walking map to download online. You’ll be hard-pressed to find a better picnic spot with acres of grass and shady trees. If you’d prefer to buy your own, then White Peaks café has gorgeous soups, wholesome sandwiches and amazing cakes plus healthy and imaginative kiddies lunchboxes, an ice-cream parlour, bottle-warming facilities and a place to fill drinks bottles. The closest underground is Kew Gardens station, which is 500m from Victoria Gate. By train from Waterloo via Vauxhall and Clapham Junction, Kew Bridge station is 800m from Elizabeth Gate over Kew Bridge. The number 65 bus stops right outside. Prices: Children under 4 are free. Off-peak (winter months): Child 4-16: £2.50 online and £3.50 at the gate, Adults: £11.50 online and £12.50 at the gate. Concessions: £10 online and £11 at the gate. From 1 February to 31 October: Child 4-16: £4 online and £5 at the gate, Adults: £16 online and £17 at the gate. Concessions: £14 online and £15 at the gate. Opening hours: daily 10am-345pm (until 9 February) and 545pm (until 24 March). See website for summer opening hours. The White Peaks Gift Shop is a real treasure trove for beautiful nature books and out-of-the-ordinary gifts (perfect for stocking up on birthday presents). William, 3, hasn’t stopped playing with his Bug Hunter Kit, with its Dorling Kindersley book about insects and bug-catching device that looks like a pair of scissors with a ball attached (£8.99). The database of plants, fungi and seeds is extraordinarily comprehensive – if they can’t find the answer to their conservation homework here, they can’t be looking hard enough!